The mobile app is expected to increase transparency and participation in Basel, Rotterdam and Stockholm convention meetings. Available for Android and iPhone/iPads. 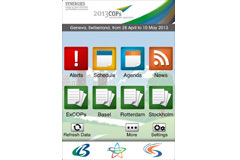 The Secretariat announced the release of the free mobile phone app Synergies on the opening day of the ordinary and extraordinary meetings of the conferences of the parties to the Basel, Rotterdam and Stockholm conventions (COPs). Synergies provides a window to information about the meetings of the global chemicals and wastes conventions. It gives quick and easy access to essential information about the 2013 COPs. More than 1,700 participants are expected to attend the two-week long conference. The app provides Alerts, Schedule, Agenda, News, ExCOPs, Basel, Rotterdam and Stockholm conference documents, and General Information for the COPs. It was designed by Zero to Heroes Media (Vancouver, Canada) working closely with the conventions' Secretariat, based in Geneva. The free app can be downloaded from the Apple App store for iPhone/iPad users and from Google Play for Android users. After the 2013 COPs, Synergies will continue to provide similar information at future major meetings of the Basel, Rotterdam and Stockholm conventions. The ordinary and extraordinary meetings of the conferences of the parties to the Basel, Rotterdam and Stockholm conventions included a high-level segment on the afternoon of Thursday, 9 May 2013 and the morning of Friday, 10 May 2013. The objective of the high-level segment was to raise ministers’ awareness on chemicals and wastes issues, encourage synergies among ministries at the national level and elevate the profile of chemicals and wastes in national development agendas. 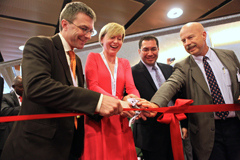 It also provided an opportunity for ministers to share experiences and best practices. Invitation letters have been sent to Ministers of Foreign Affairs, Environment, Health and Agriculture to attend the high-level segment. Ministers planning to participate in the high-level segment are invited to register no later than 9 February 2013. At their joint meeting on 13-14 December 2012, the bureaux of the conferences of the parties to the three conventions agreed to set up a small group to help prepare for the high-level segment. The group will develop the arrangements for the high-level segment with the support of the Secretariat. The theme for the high-level segment will focus on synergies and the national implementation of the three conventions. The outcome of the work of the small group will provide input into a document for the high-level segment and will be published on this webpage as soon as it is available.